EWRI: Stop the Support of the Dictatorial Ethiopian Regime! 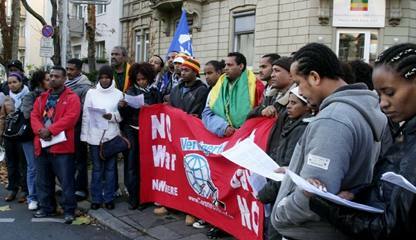 (19.11.2009) With a rally in front of the Ethiopian consulate about 50 demonstrators protested in Frankfurt today. Members of the Ethiopian War Resisters’ Initiative (EWRI) had invited to this rally considering the beginning campaign for the election in May 2010. “We believe”, EWRI stressed, “that all forms of war and military oppression are a hindrance to justice, freedom, democracy, rule by law, human rights, and sustainable peaceful development in our country and the whole region. 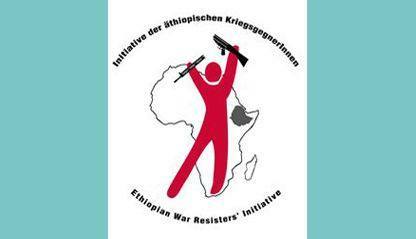 The Ethiopian War Resisters’ Initiative (EWRI) is dedicated to a long-lasting peace on the basis of human rights and the rights to refuse war, militarisation, forced recruitment and to oppose all forms of human rights violations.” With this position EWRI is part of a regional resistance movement together with other initiatives. Therefore refugees from Eritrea and Uganda joined the rally and expressed their solidarity with the activities of EWRI. Booklet "Gegen Krieg und Diktatur in Äthiopien"
(10.11.2009) Ethiopian War Resisters’ Initiative (EWRI): For Peace and Democracy in Ethiopia - EWRI call to a Rally and Manifestation in Frankfurt/M.